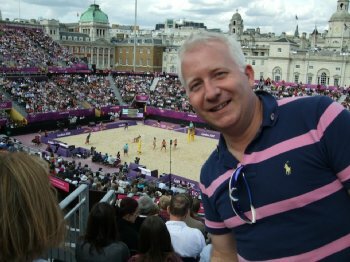 University of Ulster web manager, Paul Gilpin, is settling back into his daily routine after the experience of a lifetime volunteering at the London Olympic Games. He was one of 70,000 volunteers, also known as ‘Games Makers’, working at the hugely successful sporting event. Paul, 41, who is based at the Coleraine campus, was part of the specialist team responsible for updating the London 2012 website (www.london2012.com). “As a Games volunteer we were very busy in our teams working on various parts of the website during our shifts. Everyone involved had a real ‘can-do’ approach and help from a colleague, if you ever needed it, was always on hand. Most of the team manage websites professionally, so if there were any problems we’d just ask each other. It was fantastic working in a team with such a wealth of professional website experience and knowledge to draw upon. The London 2012 website was developed with users in mind and the dedicated team that Paul was part of were committed to creating inspiring news stories, providing medal updates, and building great photo galleries from the 5,000 daily images provided to us by the Getty photographers. The content had to be engaging, fast and accurate to inspire people across the globe. The team also exploited social and mobile media by using Facebook and Twitter, to make London 2012 ‘everyone’s Games’. In so doing the team offered everything from key information for spectators to updates on events. “At peak times we were asked to issue a London 2012 tweet every 15 minutes to make sure people had up-to-date information. As you can imagine it was pretty full-on!” said Paul. To provide some context on what the web team delivered, the London 2012 website had 431 million site visits, 109 million unique users, 15 million mobile application downloads, 4.73 billion page views and 4.7 million social followers. Putting those figures further into context and the website reached three times more people than the BBC's Olympic website, reaching twice as many people as the BBC's TV coverage. “That’s not bad going for a group of 20 full time LOCOG staff and 40 volunteers working round-the-clock for 18 days!” said Paul. “It’s fantastic to reflect on what we achieved as volunteers and I am rightly proud of what we helped deliver. Paul is passionate about sport and does a lot himself including, cycling, kayaking and snowboarding. But this was the first time he had ever volunteered at a sporting event. “I love sport and I wanted to get involved and help out and offer something special at London 2012. I was lucky enough to get tickets for basketball, badminton, volleyball, beach volleyball, hockey, diving and the women’s road race cycling during my time at the Games. “I really enjoyed all of the sport that I got to see in person especially the basketball and beach volleyball - which was a real spectator hit during London 2012. The atmosphere in both venues was out-of-this-world.